When in March 2005 former Secretary General Kofi Annan proposed in his report “In larger Freedom: toward development, security and human rights for all” the creation of the Human Rights Council to address the “credibility deficit” of the Commission on Human Rights, the aim was first and foremost to “create an organ that would be better placed to meet the expectations of men and women everywhere.” This proposal was later endorsed by Heads of States and Governments at the 2005 World Summit, who agreed that the new Council’s main purpose would be to address gross and systematic violations of human rights and make recommendations thereon. As such, the Council’s protection mandate, as spelt out in UN General Assembly resolutions 60/1 and 60/251, requires it to protect individuals from abuses. It is primarily aimed at situations of on-going violations within states. Protection ideally includes a swift, strong, and short-term response to these violations. Article 3 of resolution 60/251 emphasises that the Council must address situations that include, but are not limited to, gross and systemic violations. The scope of the mandate thus clearly allows for any situation of human rights abuses to be addressed by the Council. In effect, power is given to the Council to respond to violations whenever and however they occur. The key question is, in its eight years of existence, has the Human Rights Council fulfilled this protection mandate? Since its creation, the Council has adopted a total of 762 texts, the vast majority of which were resolutions (>85%). Prima facie, it thus seems to have been very proactive in dealing with human rights issues. Furthermore, its output is on the rise: in 2006 the Council adopted a total of 43 texts, while in 2014 it adopted 112, an increase of 160%. The Council adopted each of these texts under one of its ten agenda items, which include the annual report of the High Commissioner for Human Rights and UN Secretary General (item 2), thematic issues (items 3, 8, 9) and country-specific issues (items 4 and 10). Item 1 deals mainly with organizational and procedural matters, item 5 with human rights mechanisms, and item 6 with the Universal Periodic Review. Item 7 is devoted to the specific issue of Palestine and the Occupied Territories. 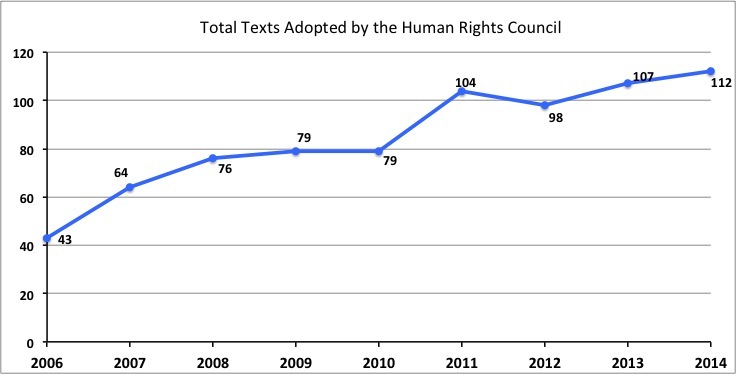 Research conducted by the Universal Rights Group indicates that since the Council’s creation 69% of the texts it has adopted were on thematic issues, while only 24% dealt with on-the-ground situations in particular countries. Given these figures, one may question whether the Council is deviating from its main mandate of addressing cases of violations of human rights, and is thereby growing increasingly disconnected from grass root realities. Item 3 resolutions are almost always broadly thematic, dealing with issues ranging from freedom of expression, torture and peaceful protest to climate change, arms transfer, foreign debt, illicit funds and traditional values. However, the problem with general resolutions on such topics is the difficulty of monitoring the protection of the right in question across all the countries of the world. While some resolutions have created thematic Special Procedures mandates for this purpose, the Special Rapporteur or Independent Expert can only visit a limited number of states per year. Furthermore, the mandate-holder’s time for discussion of his/her country visits in the Council is increasingly limited as the its schedule becomes more and more packed. 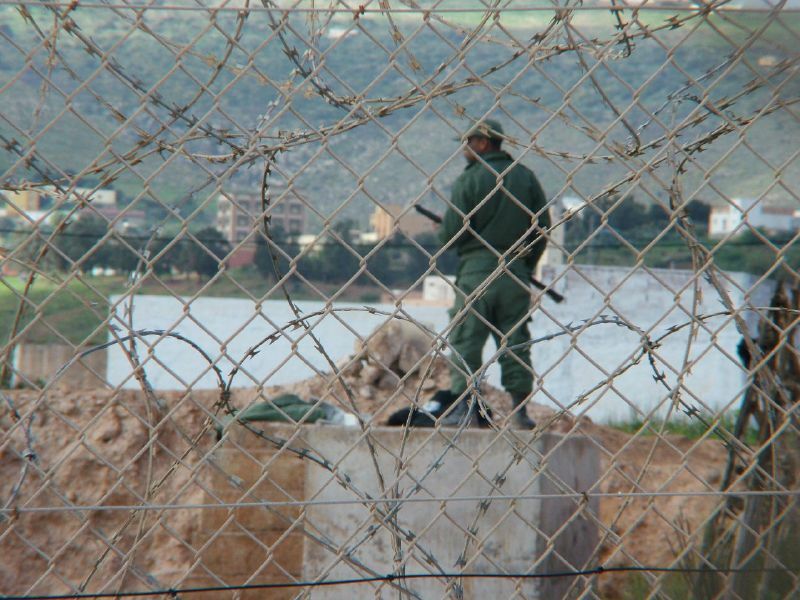 There may be a dark motive behind the proliferation of thematic human rights resolutions. Put simply, many states with poor human rights records (eg. those ranked by Freedom House as “not free” or “partly free”) have sought to subvert the Council by inundating it with thematic resolutions that they can easily hide behind. Constantly expanding the scope of thematic issues addressed by the Council dilutes its core notion of human rights, and thereby allows illiberal states to shift the focus away from addressing specific violations and towards discussion of conceptually vague rights that place no concrete obligations on states. Sadly, on many occasions these trends are supported by more progressive states, which turn a blind eye to violations occurring in “non-liberal states” because of strategic alliances and to ensure cross-regional support on their own priority thematic issues. If such trends continue the Council risks being perceived more as a forum for discussing thematic issues than as a body whose primary activity is addressing cases of violations of human rights around the world. Without any provision to maintain the protection mandate, the proliferation of conceptually vague thematic issues at the Council will eventually become its Achilles’ heel. It is already beginning to put a strain on its limited annual session time. 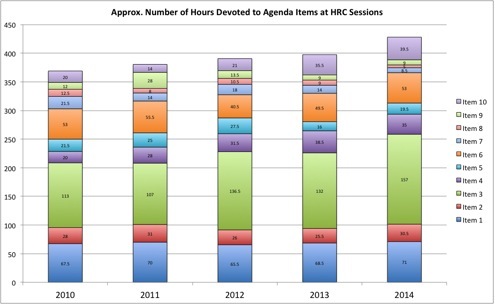 As shown in the above chart, during the period 2010-2014 activities under item 3 took up approximately 1/3rd of all of the hours the Council spent in session (37% in 2014), with an average of 129 hours devoted to it per year. 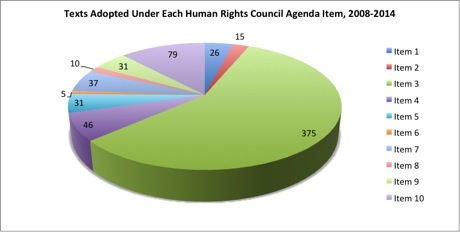 This is in stark contrast to the hours devoted to item 4, “Human Rights Situations that Require the Council’s Attention”, which comprised less then 10% of the total, an average of merely 31 hours per year. Furthermore, a survey carried out by the Universal Rights Group in which Permanent Missions and NGOs were asked their impression of the perception of the Council among victims of human rights violations revealed that 40% of respondents felt that victims of violations of human rights had a negative impression Council, while only 9% of respondents felt they had a positive impression. A further 25% of respondents felt that victims were unaware of the Council’s work of the Council. The proliferation of thematic resolutions under item 3, and the disproportionate amount of time devoted to that item each Council session, do not necessarily imply that the Council’s agenda requires a complete overhaul. Rather, states could look beyond the “promotion” element of item 3’s definition, and recognize that the “protection” element allows resolutions under that item to address specific violations related to the resolution’s theme. In other words, a thematic resolution need not be entirely general, but instead can address its particular theme in the context of a specific country or region. This form of “hybrid” resolution would combine the thematic character of item 3 with item 4’s attention to particular situations of human rights violations. Such resolutions are not unprecedented: in June 2010 the Council adopted resolution 14/15 on “Addressing attacks on school children in Afghanistan.” In this resolution, the thematic issue of children’s right to education was merged with a country-specific situation. Such an approach makes the Council more focused on the actual violations of human rights in particular countries or regions. It also brings greater international attention to the specific groups of people whose rights are being violated and offers appropriate remedial action, thereby making the Council more responsive to cases of violations on the ground and thus more in line with its protection mandate. A hybrid resolution would have been well suited to addressing the recent abduction of school children in Northern Nigeria. Though the situation was been widely covered in the media, the Council has so far failed to discuss it in any focused fashion. Similarly, hybrid resolutions would be useful in linking the thematic issue of enforced disappearances with specific countries or regions. This specificity would bring a more focused attention to prolific instances of enforced disappearance, rather than discussing the issue at a purely general level without concrete outcomes. The same reasoning could also justify hybrid resolutions on the issue of protecting human rights of minorities in Iraq or in Ukraine, and in countless further instances. Human rights violations do not differentiate between being “thematic” and being “country-specific”, and there is no reason why human rights resolutions should draw so strict a distinction. Instead, hybrid resolutions offer an innovative approach to addressing specific cases of violations in the context of their general theme. Such resolutions would enhance the protection mandate of the Council, and help redirect it from becoming a thematic talking-shop into serving as a body that responds quickly and efficiently to cases of gross and systematic violations of human rights.